The steaminess of summer is long gone and it may or may not be about time to start dreading the inevitable arrival of winter weather, which means it's time to crack open that pumpkin beer, break out your decorative gourds, and get outside to see America's annual show of fall colors. Above-average moisture and temperatures this summer mean this year's foliage is arriving a tad later than usual, but should be especially good. To make sure you can perfectly plan your leaf peeping to catch the colors at their absolute peak, SmokyMountains.com has released its annual interactive fall foliage forecast map, predicting when and where the leaves will be at their most vibrant. No forecast is 100% accurate and a number of factors affect when and for how long trees with see their peak -- for instance if a storm rolls through and blows all the leaves out of the trees once they've turned, you might not have very long to look at them. The best plan? Put on your favorite sweater, get outside, and say hello to Mr. Autumn while you're out there. 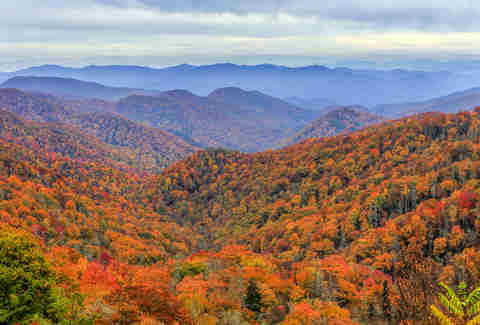 Unlike last year, when almost all of the country had reached peak or beyond peak by early October, the forecast suggests peak will arrive slightly later in 2018, thanks to "heavier precipitation and warmer temperature trends expected through September," according to the experts at SmokyMountains.com. Conditions in September are key: "While fall color vibrancy is completely dependent on weather, the most critical month is September. 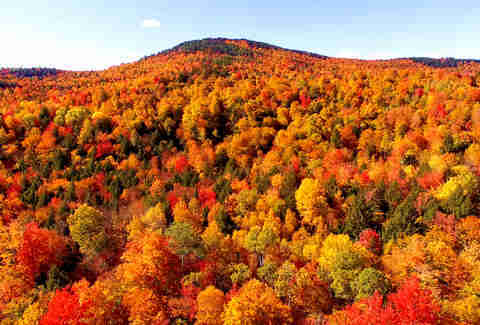 Generally speaking, crisp days combined with plenty of sunshine throughout September will produce the best colors." 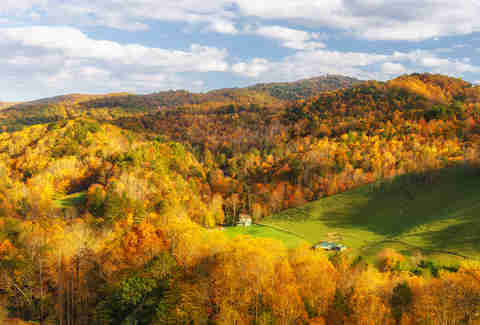 SmokyMountains.com admits that no fall foliage prediction tool or forecast is perfect, but as the organization puts it, the map is "meant to help travelers better time their trips to have the best opportunity of catching peak color each year." It's also worth noting that there are still some factors at play that can influence when the leaves will reach peak in some places and how beautiful they'll be. "Although simply entering rainfall, temperature data, elevations, and other data points into a model will never be 100% accurate, this combined with our proprietary, historical data drives our model to become more accurate each year," Wes Melton, co-founder and CTO of SmokyMountains.com, said in a statement. "However, unexpected rainfall that falls well outside of expected trends can always change the peak foliage dates and brilliance." As for New England, specifically, photographer and fall foliage expert Jim Salge of Yankee Magazine also expects an explosion of beautiful fall colors across the region, but just a bit later than usual. As Salge explains, El Nino is expected to develop, which will lead to warmer-than-normal temperatures persisting through much of fall. "Putting this all together, we are fairly confident that the leaves will be bright, bold, and healthy when they begin to change in most areas, and a colorful, vibrant show should be on tap across most of New England this year," per Salge's report. "We also believe that the leaves, especially up north, will turn a bit later than historical averages." Update: As of mid-October October, the slight delay in the changing of the leaves appears to be playing out more or less as forecasted, thanks to warmer-than-usual low temperatures in many places through the first half of the month. Officials in Maine have reported markedly less change in the leaves as of early October this year than at the same point in previous years, and have even provided a comparison so you can see the differences (shown below). The photo taken this year is noticeably different, especially compared to the photo from 2017. The delay was observed in areas extending as far south as the mid-Atlantic region, including as Asheville, North Carolina, where it looks like only minimal -- if any -- change had taken place as of early October. However, recent drone footage (shown below) reveals the absolutely spectacular fall colors that exploded in parts of northern Utah, where the change seemed to be more on schedule. Seriously, the video is just gorgeous. Unfortunately, it looks like the warmer temperatures are expected to stick around through much of October, further delaying the point where the leaves reach peak color. Forecasters predict this will be especially true in areas East of the Mississippi River, where peak colors will likely end up arriving towards the end of the month, according to a report by The Weather Channel. On the bright side, the delay means you have one last chance to plan a last-minute road trip to see the leaves before they, you know, fall. Just keep in mind that storms could roll through any given area and knock the leaves off the trees before you can see them at their best, per the report. Here's your 2018 fall foliage cheat sheet, based off the prediction map from Smokey Mountains. Where: Just in time for the start of everyone's favorite fall month, parts of six states -- Vermont, New York, Pennsylvania, Minnesota, Colorado, and New Mexico -- are forecast to be "near peak." 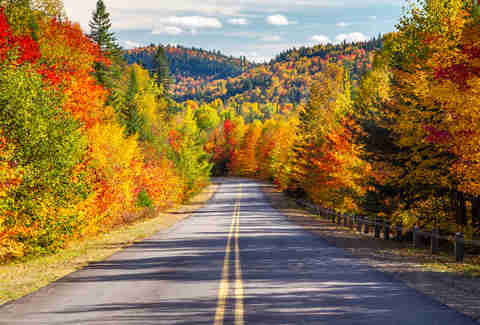 Additionally, much of the northern half of the country will see the leaves beginning to change if they haven't already. Where: Peak is expected to finally arrive in much of New York, Vermont, and northern parts of Pennsylvania, while most of the surrounding areas will reach "near peak," so that's likely where you'll want to be to see the most colorful displays. The forecast also calls for the leaves to reach peak in northern Minnesota and central parts of Colorado and New Mexico. Only states in the South will still be waiting for leaves to change at this point. 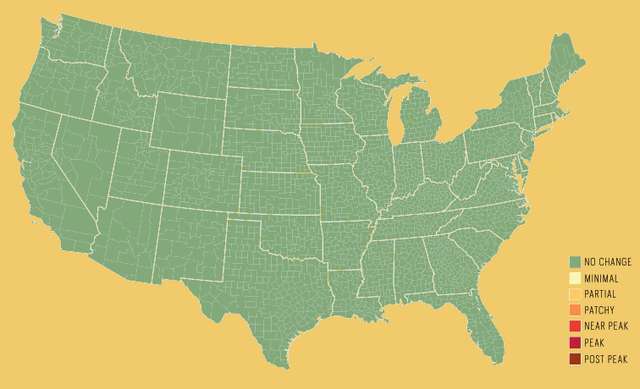 Where: Even larger expanses of the same regions are set to see peak, including several additional states like Maine, New Hampshire, Massachusetts, Connecticut, Rhode Island, New Jersey, Michigan, Wisconsin, North Dakota, Montana, Idaho, Wyoming, and Utah. Meanwhile, the areas that reached peak in the prior week are forecast to be "beyond peak" at this point and only small areas of the South remain unchanged. Where: Portions of even more states will likely get to enjoy the height of the fall beauty, including Maryland, Virginia, West Virginia, Ohio, Indiana, Illinois, Iowa, South Dakota, Nebraska, Kansas, Texas, Arizona, Washington, Oregon, and California. This appears to be peak peak, if you will, and change will be apparent in some way in every state on the map. Where: Peak is forecasted even farther south to states like Virginia, Kentucky, and Tennessee as well as to greater expanses of California, Oregon, and Washington. However, all of the Northeast, upper Midwest, and much of the areas around the Rockies are expected to reach "beyond peak" as November nears. Where: Most of the country will likely be beyond peak at this point, especially places in the North that are known for gorgeous fall colors. However, peak will continue to expand to new places in the South and almost all of California. Where: As winter begins to take hold, only parts of the South are not expected to be "beyond peak." Elsewhere, there likely won't be much left to see. "Beyond peak" dominates the map. Perhaps the only real challenge you'll face before diving into all of the fall colors is deciding on where you want to go. Check out past reports we've done on the best places to see fall colors in New England, and the best places for foliage in the rest of the country. Another option to consider? Hop on a train and look longingly out the windows, without having to worry about on-coming traffic. We've catalogued America's most charming train routes to take in the fall. Chances are you don't remember this lesson from grade school science class, so here's a quick refresher. To understand why leaves turn red, orange, yellow, or brown, you first have to understand why leaves are green. It all starts with photosynthesis and chlorophyll (maybe Billy Madison was wrong). Specifically, leaves appear green, thanks to the millions of chlorophyll cells that are generated during photosynthesis in the tree's chloroplasts, the organelles that carry out the process. And here's the thing: Without all of that green chlorophyll, leaves would always look like they do in autumn. The constant creation of chlorophyll throughout spring and summer gives trees and other plants their vivid green hues because it masks other compounds in the leaves that would otherwise make them appear yellow and orange. In other words, those are the leaves’ true colors. In fall, photosynthesis slows and eventually stops due to the significant decrease in sunlight trees receive -- allowing the leaves to return to their "natural" orange, yellow, and red colors. The colors you see also depend on the type of tree. Some trees -- beeches, hickories, tulip poplars, and birches -- have mainly yellow and orange fall leaves. You’ll find red leaves on trees like sumacs, sweet gums, sourwoods, mountain ashes, scarlet oaks, red maples, and some sugar maples, according to UV. When the nutrient-producing process finally ends, the trees will essentially seal the connections to the leaves, an as a result, the leaves will die, turn brown, and fall to the ground as fertilizer for the growth season in spring and summer. So, if you missed out on peak fall foliage this year, let the brown leaves crunching under your shoes serve as a reminder: the process will happen all over again next year.